Lent is a time when we stop and ponder our hearts' intentions. We give up one thing; we embrace another. Among other things, then, Lent is a time to examine what we do and why we do it. The bottom line is: where is my heart? The Lord said to his disciples: “For where your treasure is, there your heart will be also” (Matt 6:21). This simple reflection brought me to the topic of prayer and the role of our bodies in prayer. This begs the question: Artur, how ever did you end up at such a topic, starting with the heart? The link is this: we should allow our bodies to express the prayer of our soul, and our body’s postures and gestures should be intentional. It is as simple as understanding why we use this posture rather than another one, and what the posture means. The prayer par excellence that employs a wide range of postures is the Holy Mass. We, however, go through the motions of the Mass without giving these much thought yet they are full of meaning. The above quote taken from the USCCB tries to elaborate this idea: since we are both body and soul, our bodies rightly play a very important role in prayer. If only we understood what we are doing, we would be able to more fully participate in the different movements of the Mass and our prayers would be more heart-felt. 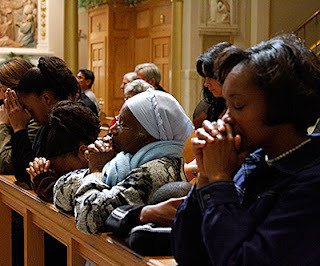 The USCCB continues: “Each posture we assume at Mass underlines and reinforces the meaning of the action in which we are taking part at that moment in our worship.” We have three general postures at a Roman Catholic Mass: standing, sitting, and kneeling. Each of these has a meaning, and the meaning is linked with what is happening in the liturgy at that time. The posture, then, is to aid us in understanding and participating in the Mass. Let us briefly take a look at these postures. We begin and end Mass by standing. We stand during the Gospel, during our profession of faith, and during the prayers of the faithful. Its meaning ranges from showing a sign of respect, honouring someone, being “ready” and attentive, and also it “...has been understood as the stance of those who are risen with Christ and seek the things that are above” (USCCB). Who do we honour? Before whom are we ready and alert? Most definitely it is Christ whom the presider of the liturgy represents, and in whose person he acts. Kneeling has had two main meanings throughout the Church’s history: that of penance and that of adoration, depending on where the traditions were formed. During a Roman Catholic Mass, the Latin Church shows adoration by kneeling. In the Orthodox Churches and the Eastern Catholic Churches, one stands during the Eucharistic prayer and a profound bow is a customary sign of adoration during the consecration. Both have their unique histories. Finally: “Sitting is the posture of listening and meditation, so the congregation sits for the pre-Gospel readings and may also sit for the period of meditation following Communion” (USCCB). This posture is a relatively new addition to the Latin Rite – it is largely absent in the Eastern Churches. Its use in the Latin rite came from the protestant reformation, where the liturgy began to take the role of teaching – the core of the liturgy became the homily of the minister and so the parishioners sat and listened to what he preached. Slowly this practice crept into the Latin Church, hence our adoption of their use of pews. In short, the postures we take during the Holy Mass are to move us deeper into our interior spiritual adoration. It is equally true that interior spiritual movements move us to such an extent that we express them with our bodies. It goes both ways. The important thing is that the body participate in our prayer. Pope John Paul II put it very well: “The body, and it alone, is capable of making visible what is invisible, the spiritual and divine. It was created to transfer into the visible reality of the world, the invisible mystery hidden in God from time immemorial, and thus to be a sign of it” (Feb 20, 1980). Perhaps this Lent can be a time to re-examine our understanding of the meaning of each posture, and to pay attention to how we “pray these postures” during our liturgies. Happy praying!